Dr. Powell received her bachelor of science degree in biology from the University of Georgia and her medical degree from Mercer University School of Medicine. She completed her residency at AnMed Health Family Medicine. 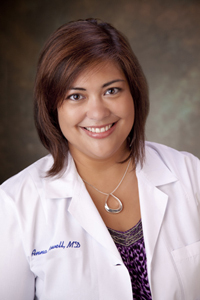 She is board certified in family medicine and affiliated with the American Medical Association and American Academy of Family Physicians. NGPG Cleveland is located at 2578 Helen Highway in Cleveland, Georgia. Call 706-865-1234 to schedule an appointment or learn more about the services the practice offers. NGPG Cleveland is open Monday-Friday from 7:30 a.m.- 4:30 p.m. and accepts most major insurance plans. Please contact the office to inquire regarding specific plans. You can also visit www.ngpg.org/cleveland for more information. NGPG Cleveland is an affiliate of Northeast Georgia Health System.